Catching up on some TV last night, I saw a reference to the Windows 7 Release Candidate. Visting the Microsft site, I saw that the download was an .ISO package - basically a pre-burned disk image intended to be a bootable DVD to facilitate the installation of Windows 7. And then it clicked: VMWare can create new virtual machines out of .ISO files. I could run Windows 7 on my Mac. Which means I could run Chrome on my Mac! Once done, I fired up the virtual machine, and Windows 7 loaded flawlessly. Fired up IE, downloaded Chrome, and there you had it: I was now running Chrome on my Mac. The Release candidate is valid for a year (though it'll start degrading itself by doing bi-hourly shutdowns in March, 2010), which means that if you have a copy of VMWare, you can run Windows 7 for the next 12 months for free. Of course, Chrome on the Mac will be released natively ahead of that... but in the meantime, this isn't a bad way to test out a new OS while also getting a screaming-fast browser as part of the bargain. Below is the text of the speech I'm giving to law students graduating from the University of Richmond School of Law this afternoon. The school is recording the speech; once I have the video I'll put it up in my YouTube account. Thank you, Rob, for that wonderful introduction. President Ayers, Dean Douglass, members of the faculty, and most importantly - graduates - I'm honored to be here, and I want to thank the students for the invitation to join all of you today. When I showed up at Richmond Law, I had no idea where I'd be after graduation - the thought that I'd end up at one of the world's most influential technology companies was furthest from my mind. Much to the chagrin of my parents - and even a few professors here today - I rarely chose to do something because of where it would take me. Looking back, it's obvious to me that this is one lesson I've learned: if you think you know exactly where you're going, you're not far enough away. Of course, I almost didn't make it through the front door. Unlike nearly every other company on the planet, Google actually interviews the employees of the companies it's acquiring. As a company that receives more than a million resumes a year, Google can be awfully demanding. One of my twelve (yes, twelve) interviewers asked about my GPA in law school. I wasn't sure, but offered, "2.8? 3.0?" He looked at me: "Why so low?" Realizing this wasn't a joke, I replied: "I started a law journal, the first in the world to publish online. And it was like a full-time job, while being a full-time law student. When I graduated, the faculty awarded me the T.C. Williams award for the most significant contribution to legal scholarship." I said it just like that: one run-on sentence, without punctuation. He paused, then looked at me: "There aren't many good answers to that question. But that was a good answer." The reason that answer worked - and the reason I'm here today - is that I've been blessed to always be passionate about what I do. I've never known where the path in front of me was leading, but my passion guided me - through challenges as well as successes. When I was young, my Dad often asked, "What are you passionate about?" It wasn’t until high school that I started to get a sense of my answer. I read the Supreme Court’s ex parte Milligan opinion during a lesson on the Civil War. A straightforward case, it established that even in a time of war, the President’s powers had limits. (Amazing, I know!) I remember grasping even then the genius inherent in our Constitution, admiring the delicate balance between the branches of our government. I knew that I wanted to be a part of a system that ensured individuals like Lambdin Milligan got a fair trial. In college, I wrote a column for the school paper about the Gulf War. In 1990 - before the invention of the Web - I was exchanging e-mail with Israeli students in Tel Aviv and Saudi students in Riyadh. My column - for a school paper read by a few hundred students - had first-hand sources from 6000 miles away. The world was orders of magnitude smaller for me than it was when I left high school - and I knew the Internet was fundamentally changing life as we knew it. At Richmond, a dozen of us were convinced that these fundamental changes would apply to the law as well, and we started an online law journal. Within weeks of publishing our first issue, we had visitors from Fortune 500 companies, government agencies, nearly every law school in the country, and individuals from around the world. The ability to reach all corners of the globe - with little more than an Internet connection and something to say - was exhilarating. A few years out of law school, I worked for a former law partner of Dean Douglas. He'd started a company that built private networks for litigation management, and one of our users shared with me the secret to keeping his clients happy. (Out of respect to the many southerners in the room, I will not butcher the beautiful accent with which these words were spoken. But trust me - this is even better when said with an Alabama drawl.) "Biggest item on any bill I send is one word: Thinkin'." I've always loved that comment, because it speaks to me of the immense creativity at the heart of law practice: it's not what you read but your passion to apply what you know - that separates the great lawyers from the merely good lawyers. Google's mission is to organize the world's information and make it accessible and useful. All of the communication I've spoken of - whether through blogs, social networks, e-mail, or yes, even law journals - means it is increasingly possible for companies like ours to deliver on that mission. Let me give you a sense of the scale at which we operate: in four hours, Google indexes as much information as is contained in the US Library of Congress. In those same four hours, 3,600 hours of video is uploaded to YouTube, and six million words are written on my service, Blogger. In our lifetimes, users will have near-complete access to the information they want. What will ubiquitous access to information mean for you? Your clients? Your firms? Think, for a moment, how the practice of law would evolve if all the world’s information – including legal source materials - were searchable by anyone, anywhere, any time - for free. I don't know exactly what that path will look like, but I'm betting some of you might. I do know this: it will change how lawyers perceive themselves, it will change how the law reacts to fundamental principles like privacy, community, and intellectual property, and it will change the nature of how clients interact with their lawyers. I would hope that like me, after three years at Richmond Law you have all developed a passion for the law. If so, then I believe you have an obligation to change it. Precedent must not define the path in front of you, it can only help you navigate it. The Internet that I first saw 20 years ago is finally effecting change that is fundamentally altering entire industries. Newspapers in their current form may well be gone before any of you make partner. Every book I read last year, I read on Amazon's Kindle. Sales of CDs and DVDs are falling, just as iTunes downloads surpassed 1 billion and Amazon now delivers rented movies in high definition to my TiVo. The innovation that has reshaped these industries will certainly accelerate change within the legal profession, and those of you who shape the change that's coming must be passionate about it - and must understand the forces at work so that you might guide the law to where it needs to go. To those of you who, either after graduating today or after practicing for a bit, find your passion misplaced, or worse, lost: stop. Passion for the law does not need to mean passion for the practice of law. My path is, after all, an "alternative" path. (A word about "alternative" - when I chose to join a fledgling tech start-up after getting my law degree, the word my Dad used to describe my career choice was most definitely not "alternative".) Your JD need not be a precedent that binds you to practice. Let it be your foundation, from which you can find your own way to apply what you’ve learned. My JD informs every decision I make at Google, yet I have never practiced law. Richmond Law helped me learn how to think, how to synthesize, how to write, how to argue – and no matter who signs your pay checks, you will find these skills put you head and shoulder above your peers. I used to joke that my JD was like an MBA without math, but I'm increasingly convinced that an MBA is a JD without arguing. And trust me: the arguing matters. I'm unbelievably lucky to have studied at a law school whose leadership thought it might be cool if every incoming student had a laptop. Dean Harbaugh later admitted to me that they didn't really know what would happen when students had laptops - but by thinking just a little bit differently about the education of law students, an unexpected accident happened: some of us started a law journal. Which, among other things, gave me a good answer in my interview at Google. Today, as you graduate, the economy makes the path before you seem more challenging and even less obvious. But regardless of whether you practice law or apply your education to some other endeavor, and regardless of whether you're juggling options or looking for the right opportunity in a tighter job market, when you’ve found your passion and you think big, you'll realize that you won't find your path: it will find you. Look at me: an experiment in undergrad - Internet access for everyone as a result of a wealthy alumnus’s donation - followed by an experiment in law school - laptops for everyone - mixed with passion for technology and law - produced a legacy I remain proud of to this day. If you leave today with a diploma and a passion for the law, then you and the faculty did your jobs well and you begin your careers with nearly unlimited potential to be a positive force for change within the profession. I walked off this stage thirteen years ago. Thirteen years from now, when one of you is standing where I stand today, addressing the class of 2022, I don't know what the profession will look like, but I know it will be better because you channeled your passion and you thought big. Congratulations on your accomplishment, and best of luck in your careers. Thank you! Over the weekend on Twitter, I asked for bloggers to share reasons why they used FTP instead of Custom Domains. Most people, once I'd explained the advantages of Custom Domains, tended to agree that was the better path... and the time seemed ripe for diving in, as we'd had a number of FTP-related issues over the last several weeks. A number of users responded, and I just did a pretty comprehensive post over on Buzz (do I get the award for longest Buzz post ever? I think I do!) If you're using Blogger FTP and would like to better understand whether Custom Domains might be a better option, I suggest you check it out. We've also created a Help Group specifically around this topic, so we can answer additional questions that you might have. Please read the article, then head over to the help group if you need additional help. Thanks to everyone who provided input, and to all of you who rely on Blogger as your blogging service. 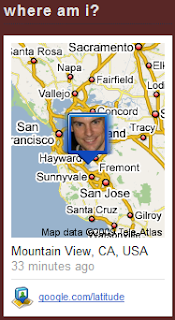 This is really cool: go to the Google Latitude badge maker and create a badge that you can add to your blog. If you use Latitude, you can show off where you're located. Works on all blog platforms, though there's a simplified +Add to Blogger button. More details at Blogger Buzz.